NES Rush'n Attack (USA) in 09:35.9 by Randil. In this game, two jovial brightly-colored soliders infiltrate enemy forces. Everyone here runs around menacingly, and bullets are a bit slower than a housecat. This movie is about a 2 second improvement to the previous version. Note: The name of this game is Rush’n Attack. The 'n does not stand alone as a contraction of and, unlike Ghosts ’n Goblins. Given the theme of the game, the pun on “Russian Attack” is quite obvious. 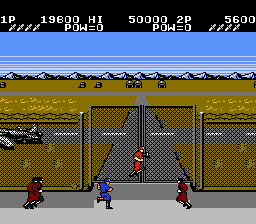 You can watch this run played back on a real NES console.